Please Note: this item is offered without the fabric. 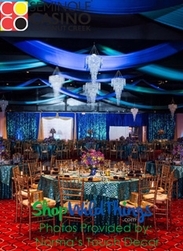 The main image does show the curtain with the optional fabric panels that we have available for purchase. 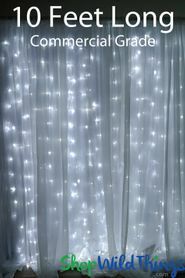 This Warm White LED Curtain with 200 lights is fabulous, simple, attractive, inexpensive and commercial grade! Just what every party planner likes to hear! 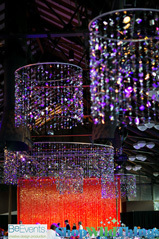 These warm white lights give a soft, romantic glow - the perfect addition for any event and venue. 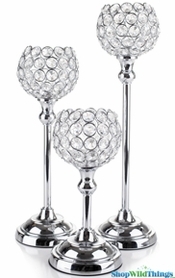 Event decorators and wedding planners know that lighting is essential for creating a warm and welcoming atmosphere and setting the mood for a memorable, classy occasion. 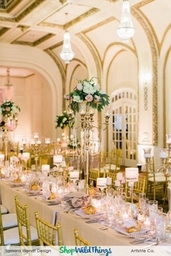 The proper lighting can make their life easier by reducing the time and effort required to set up their venue while providing a chic presentation. 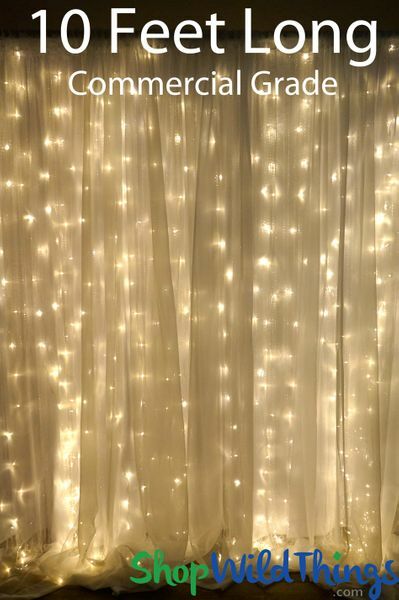 In the main photo, you'll see that we have photographed these fabulous curtains of lights hanging behind our sheer curtain panels that are part of our Pipe and Drape Wedding Backdrop Kit. The String Lights do not include fabric for this item. 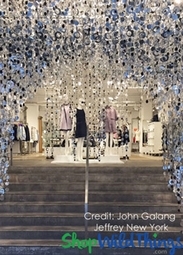 This Lighted Curtain is 4' wide (end-to-end) and there are 10 strands, each 10' long. The insulated wire is silver and each strand has 20 LED lights. The curtain can plug right in to the UL Listed power plug or if you need a longer cord, the extension cord (included) is a generous length of 16 1/2" and it perfectly matches the curtain. Up to 5 curtains can be end-to-end connected. 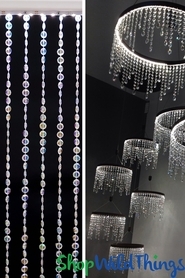 The energy efficiency of LEDs make them unbeatable and the soft, flexible wire makes this lighted curtain easy to maneuver how you wish and that's a delightful way to decorate! 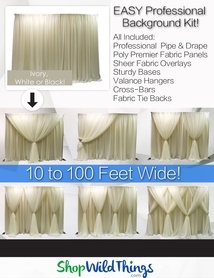 You can fold the curtain in half (width wise), bend around a corner, use on peaks, curves or uneven walls, bunch all the strands together, tie them off or shorten the strands by looping the bottom into the top! Whatever your application calls for, this curtain will adapt to your needs. Hang inside a gazebo, patio, tent or pavilion. 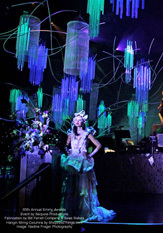 Use as a stage design element or create a backdrop behind a head table by combining with tulle for a soft, lighted feature which also makes an elegant photo backdrop. Hang in front of windows, hang behind or on a Wedding Arch. Mask walls or columns by turning them into fabulous lighted focal points or create an upscale look by displaying them behind String Curtains. This 110V LED Curtain Light can be used outdoors only with a covered ground fault receptacle. Do not immerse any part of the curtain, wire or plug in water. 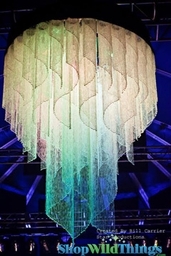 Each curtain has a male and female connector, so you can end-to-end connect these curtains to create a wall of light! The male connector attached to the curtain (as well as the extension wire) has a small groove cut out on the plug between the prongs. Make sure this groove lines up with the ridge on the female connector (plug and extension wire). These looked lovely for our Starry Night theme prom! Love them, they were gorgeous! Thanks!! 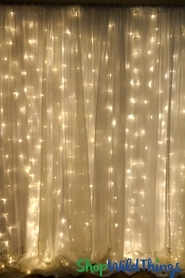 I bought the lights for a wedding and they were perfect. I loved them! !